The 33-mile long Newfound Gap Road is the main automobile route through the Great Smoky Mountains National Park. It crosses the crest of the Smoky Mountains at Newfound Gap to connect Gatlinburg and Cherokee. Drive time is typically one hour. Now that the rock slide on I-40 has blocked the interstate passage to Gatlinburg from east, the route from Cherokee has become even more important to visitors. Newfound Gap Road was engineered in the 1930s specifically so motorists could optimally experience the spectacular mountain vistas and tremendous diversity of forest types for which the Great Smokies are famous. The route was carefully constructed to blend in with the natural landscape and to take full advantage of the scenery. 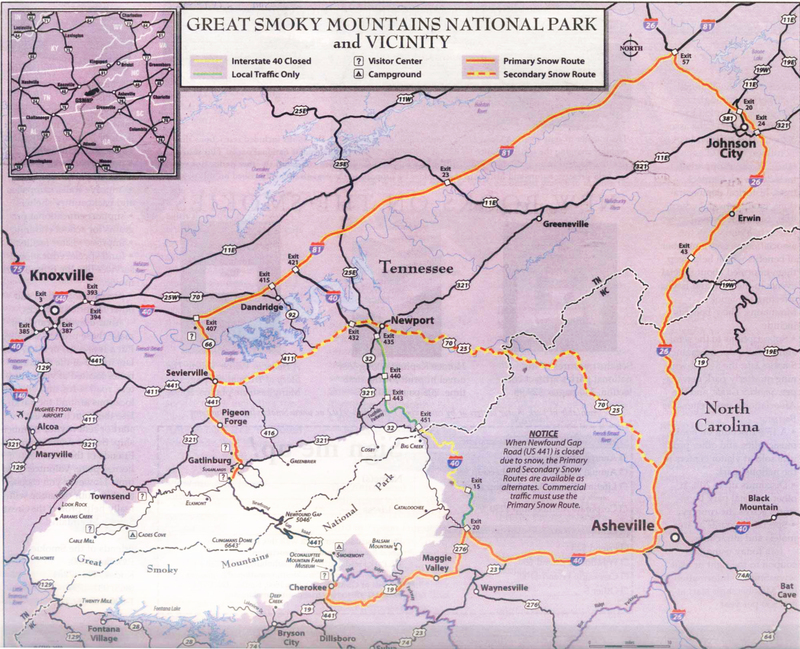 Numerous pull-outs are located along the road, offering travelers views of the Great Smokies and adjacent mountain ranges. At Newfound Gap, where the road reaches its highest point, temperatures are frequently 10 to 15 degrees cooler than in Cherokee or Gatlinburg. The higher elevations of the park also receive considerably more precipitation than the surrounding valleys. Annually, Newfound Gap records over five feet of snow. This combination of low temperatures and high precipitation results in periodic episodes of hazardous driving conditions from November to April. For safety, the Park imposes certain restrictions driving when Newfound Gap and other roads are snow or ice covered. Signs are posted at both ends of the road informing drivers of current restrictions. For example: Chains or 4WD Required, Chains Required, and Road Closed. For current road and weather conditions, call (865)436-1200. Extension 630 for Weather Conditions. Extension 631 for Road Conditions.